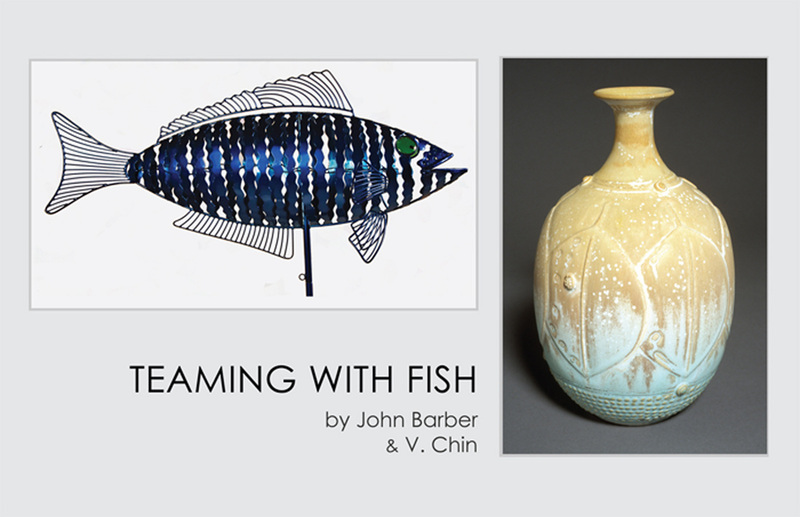 Archway Gallery presents Teaming with Fish, an exhibition featuring fine porcelain and stoneware works by V. Chin and metal fish sculpture works by guest artist John Barber. The exhibition will be on view December 3, 2011 through January 5, 2012. The artists will be on hand to visit with guests during the exhibition opening reception on Saturday, December 3, 2011 from 5 – 8 pm, with an artists’ talk at 6:30 pm at the gallery. Vorakit Chinookoswong, known widely as V. Chin, has been crafting fine porcelain and stoneware pieces for more than 30 years. An experienced participant in juried art festivals and gallery shows throughout Texas, Chin creates glossy stoneware vases, bowls, cups and other pieces bearing his signature clay frog. Striving for a balance between aesthetics and function, Chin's subtle glazing adds an extraordinary level of elegance to his pottery. His work truly represents a complete harmonization of skill, creativity and heart. Chin, who was born in Bangkok and grew up in Japan, gained an appreciation for balance working under Japanese potters. Early in his career, he received a degree from the Kyoto Institute of Technology in inorganic materials and then went on to serve as an apprentice to a well-known Japanese potter. He moved to the United States in 1980 and established his studio in Seabrook, Texas. His distinctive style emerged and many of his works began to feature a very distinctive small frog. Other works are reminiscent of ancient, museum quality, fine porcelain with delicate designs. His distinctive style and excellence in his craft has gained him many local, national and international followers. Archway Gallery Director John Slaby stated, “It is not unusual for V. Chin’s entire exhibition of work to sell out. There have been times when the red “sold” stickers come out as he uncrates his work for the exhibit.” His unique and elegant works of art are featured in prominent galleries and private collections around the world. In addition to creating his art, Chin also teaches pottery in the Houston Heights. Knowing that he and his friend and metal fish sculptor, John Barber, both understand that fulfillment is defined as the simple harmony between a man and the work he performs, Chin invited Barber to join him as Archway’s guest featured artist for this exhibit. Barber works in metal and carbon steel and has made his living in the field of museum exhibit work over the past 30 years, wearing many hats such as exhibit artist, designer, shop supervisor and project manager. He has worked for several natural history museums including the Houston Museum of Natural Science, where he designed and built the armature for the huge Diplodocus dinosaur skeleton that stands guard over the Dinosaur Hall. In 1994, he started his own design shop, John Barber Studios. His clients include the Aviation Hall of Fame in Galveston, the Star of the Republic Museum at Washington-on-the-Brazos State Park, the Texas City Museum, Houston Center for Contemporary Craft and Butler Longhorn Museum in League City. In a collaboration of steel wire and oil paint on wood, Kay Sarver brings a distinct perspective that speaks to the intrinsic nature of our existence. Painted, earthy figures reminiscent of Indigenous women of the Americas are her human contact. Through her work, Sarver asks viewers to contemplate life beyond the physical realm and explore the world of spirit and the deep connection between these two. Sarver further heightens the visual experience of her work by using multiple gauges of steel wire shaped into various animal, plant and other worldly forms to establish a more ethereal impression of each subject’s “inner self.” Often these wire forms are attached to the paintings themselves, while the painted figures subtly interact with their eyes closed. Sarver believes this will help to invoke the sense of “feeling” the energy of the nonphysical part of something, rather than seeing it’s physicality with eyes wide open. “In this kind of tender, reverent relationship with life, we begin to understand the fundamental parallel to our thriving in a healthy, balanced existence on Earth,” she said. After growing up in the Mid-West and attending the University of Cincinnati in the Fine Arts program as a Painting major, Sarver moved to Florida for a few years and then moved to Texas. In 2000, she made her first trip to Mexico, not knowing just how much this would change her life and the direction of her art. She saw something different in the faces of the people she encountered, aside from their obvious indigenous heritage. The paintings she developed from these first impressions connected legends and traditions with modern-day struggles. As her relationship strengthened through her involvement with these Native American cultures, she began to learn about the deeper connection to life and “Spirit” and her inherent longing to fully comprehend and embrace this state of being. 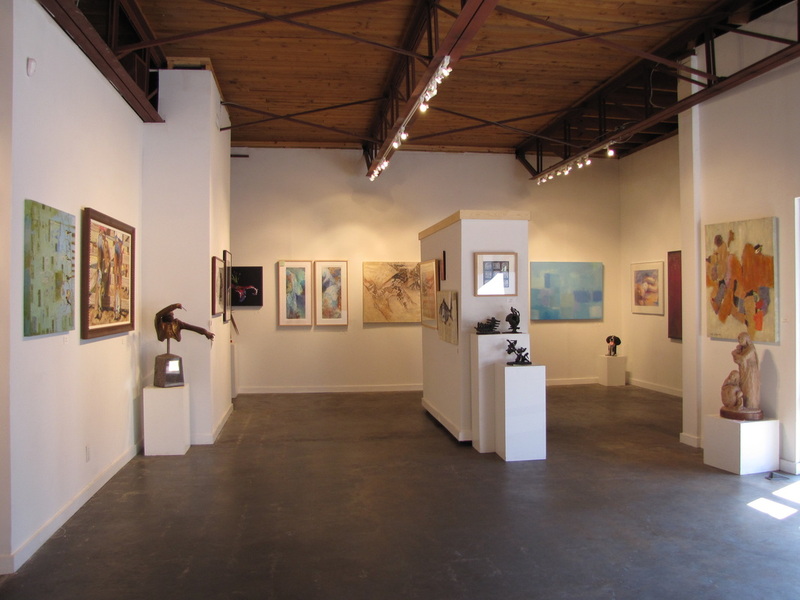 Houston, Texas (August 10, 2011) – Archway Gallery, an artist-owned collaborative gallery, is celebrating its 35th anniversary this year and in honor of this milestone has organized a special 35th Anniversary Retrospective exhibition, featuring 30+ former Archway Gallery Artists from 1976 – 2011, including several founding members. Many of these former artists will be on hand to visit with guests during the exhibition opening reception on Saturday, October 1 from 5 – 8 p.m. at the gallery. Archway Gallery opened its doors on April 1, 1976 with eleven members at The Jung Center in the Houston Museum District. While the gallery has had several homes over the years, including The Jung Center and a space on West Gray, it is currently located at 2305 Dunlavy and has 30 artist members who create work in a variety of media and styles. Each member’s work is on display year round and there are always artists on-site, manning the gallery. Archway Gallery has been home to more than 80 artists since its founding in 1976. Archway Gallery members are also the gallery owners and are adept in the daily operations of the art gallery. Many former members have moved on to successful careers as artists. Some have founded their own galleries, both in the Houston area and elsewhere. Many are active in art organizations that support and nurture the arts in their locales. 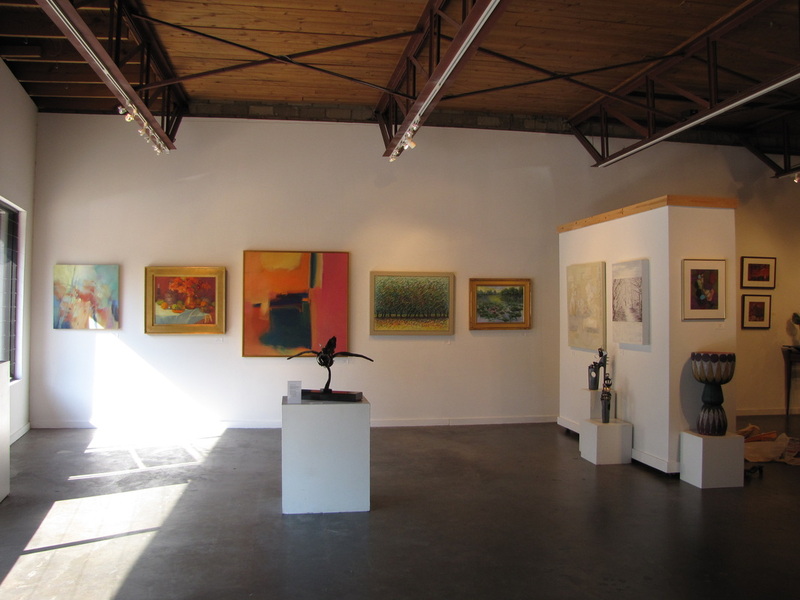 Over the past 35 years, the members of Archway Gallery have made significant contributions to the development of a successful art community in the Houston region, launched successful art careers, fostered the growth of area art galleries and been a model of an artist-owned cooperative gallery. Archway has hosted three annual juried exhibitions in 2009, 2010 and 2011, giving other artists the opportunity to display their work and win cash prizes. In addition, the first place winner displays their work at the gallery for one month. Moreover, proceeds from the sales have benefitted some of Houston’s most deserving non-profit organizations including the Houston Humane Society and the Houston Area Women’s Center. Archway has contributed to the growth of not only the visual arts but the written and spoken word. For the past 14 years, Archway has hosted “Archway Readers,” where Houston area writers gather for monthly readings. Other Archway events include “Tea and Tour,” where visitors have the opportunity to enjoy an in-depth look at the art and artists of Archway Gallery. Happenstance represents the creating of fortuitous circumstances and Anita Nelson’s love of anything with fur, feathers, scales, fins or shells. Generally reflected in the art is a sense of irony or a twist of fate. Each painting has a story to be told and allows the viewer to carry the story from the point of being introduced to the piece. Each painting contains its own individuality. It evolves not by a certain plan but by its own need to exist. In 2004, after many years as a freelance illustrator, Nelson decided to rediscover her artistic roots and paint what she loves. Her work is more involved with whimsical images and the creation of childhood memories. She uses a range of materials in “old master” and “contemporary” approaches to create images always showing her love of animals. Oil paints, acrylics, colored pencil, ink make up the majority of the material used. Recently her primary focus is using acrylics on composite board, clay board or cold press watercolor board. Nelson earned a B.F.A. from the Cleveland Institute of Art in Enameling with a Painting minor and Masters of Art Education from Case Western Reserve University in Ohio. She currently resides in Missouri City, Texas area with her artist-husband Mark A. Nelson, cats Zog and Zig-Zag and their arch rival Zuzu the wonder dog, where she paints in her home-based studio. Nelson is one of the newest artists at Archway Gallery in Houston and represented by Wally Workman Gallery in Austin, Texas. Along with having several one and two person shows, her work is in many private collections and part of the University of Wisconsin Hospital Collection. Veronica Dyer’s works fuse the emotional impetus of Abstract Expressionism with Color Field painting. Her primary medium is acrylic on canvas where she often incorporates mixed medium and layering techniques into her paintings. Her works range from large-scale canvases – 42’x 72’ – to small-scale works that are 12” x 12” in size. She will also show a series of ink on paper works that range in size from 16’ x 20’ to 5” x 8”. Dyer is a native of Maracaibo, Venezuela. She moved to the United States in 2000, and currently resides and paints daily in her home in League City. She became a U.S. citizen in February 2010. Dyer was born into a family of artists. Her grandfather was a painter of Venezuelan pastorals. Her father grew up in France and was both a painter and sculptor. Consistent exposure to his art influenced her desire to paint and she has pursued that passion since she was 13 years old. Dyer has had exhibitions in Maracaibo, Venezuela as well as McAllen, South Padre and Houston. Her work is part of private collections in the United States, Mexico, Canada and Switzerland. Currently her art can be seen in Houston in Archway Gallery, Mixed Emotions Gallery, Galeria Regina and Space. She is one of Archway Gallery’s newest member artists. Archway Gallery presents Visions, featuring metal sculpture by its newest member, Jim Adams. The exhibition will be on view June 3 - 30, 2011. The artist will be on hand to visit with guests during the exhibition opening reception on Saturday, June 4 from 5 – 8 p.m. at the gallery, with an Artist Talk at 5:30 p.m.
Adams’ takes metal objects or parts that are considered “scrap” and recreates them as art. These utilitarian objects are transformed into works of pure delight or objects that convey a substantive message. The 'Visions' pieces are inspired by the characteristics of the various industrial scrap items used to create them. Most of the 'Visions' work is minimalist and, to a degree, abstract. The artworks are diverse in theme, from surrealism to thought provoking abstracts. The nature of the work is extemporaneous, raw and powerful. Most of these works are solid and substantial and can be displayed outdoors as well as indoors. Weathering only adds to the rich coffee colored patina the works possess. Some of the works can become a focal point in a garden, while others are destined to be the center of attention in their own right. As a self taught sculptor Adams took up artistry in iron and steel in 2007 after 24 years in the information technologies field. Prior to his years in IT, he had worked in the welding industry, selling specialty welding items for approximately eight years. During that time, he developed the skill and knowledge of working with metals, and that foundation led to his career as an artist. Adams has had several solo exhibitions including “Iron and Steel” at the Rosenberg Railroad Museum; “Not Bound by Frames” at H Gallery, Houston; “Another Life” at the Tremont Hotel in Galveston; “Ferro” at Miller Center for the Performing Arts/Railton Gallery in Jefferson City, MO. ; and ‘From the Scrap Pile’ at Missouri State Museum/Rozier Gallery in Jefferson City, MO. His work has been shown in a number of galleries throughout the Houston region as well as in Kansas and his home state of Missouri. Gallery presents Caliente: Full Frontal Color featuring new paintings from artist donna e perkins. The exhibit is on view May 7 through June 2, 2011. The artist will be on hand to visit with guests during the exhibition opening reception on Saturday, May 7, 5 – 8 p.m. at the gallery, with Artist Talk at 5:30 p.m. Light refreshments provided by Hot Mamas. “I steal lines and choreograph them into the structure of my paintings,” states Perkins. Her lines are drawn from dancers dancing and her paintings become abstractions, not of the dancers, but of the dance and movement. For Perkins, “dance is primal, primitive and beyond reason, a ritualized form of expressing desire and animal need.” For her, the painting process is a passionate, wordless dance with the tactile sensuality of graphite and paint. After seven years of painting canvases in blacks, whites and grays, Perkins has submerged herself in color - hot color. In her Caliente series she revels in the sensuousness of intense color that develops when she layers paint onto her canvas. This recent series employs splendid, even decadent colors, with no discernible subject matter, rioting in space. The lines in the Caliente series were drawn at rehearsals of Frame Dance Productions (www.framedance.org ). Choreographer and dancer Lydia Hance will present sections of her dance work Mortar, Sylphs Wrote, made possible by a Hope Stone, Inc. HopeWerks residency grant, at Archway Gallery on Saturday, May 21 at 7:30 p.m.
Perkins finds that she is continuously inspired by dancers and their choreography and it informs her paintings. For her 2009 Entanglements show at Archway Gallery, Perkins collaborated with choreographer/dancer jhon r stronks. When Perkins was small enough to stand in the church pew, her parents gave her paper and pencil to keep her quiet during services. In junior high she was given oil paints. She’s been drawing and painting ever since. After earning a Master’s Degree from the University of Houston at Clear Lake, Perkins taught art in public schools for 20 years. She is now a full time artist and has been a member of Archway Gallery since 2008. Archway Gallery presents Fusion by artist Rosanne Hudson and TXT by 10+ Artists at Archway Gallery. Exhibition on view April 2 – May 5, 2011. The artists will be on hand to visit with guests first-hand during the exhibition opening reception on Saturday, April 2 from 5 – 8 pm at the gallery, with an artists’ talk at 5:30 pm. Light refreshments and valet parking provided. Archway Gallery presents Fusion, featuring new work from artist Rosanne Hudson, alongside TXT, a special exhibition featuring the collective of female artists known as 10+Artists of which Hudson is an active member. Hudson has several pieces in the TXT portion of the exhibit. Hudson chose Fusion as the title of her exhibition because her new body of work fuses together her past painting styles. This gives her work a thread of continuity that blends her artistic explorations. An oriental flair is present in much of her work, which evolves into occidental shapes, colors and textures, yet blends into her non-representational, contemporary style. “Sometimes you have to walk away, returning even months later, to find that element of design and fusion of colors that brings a piece back to life and to completion,” said Hudson. Hudson has developed her abilities by participating in continuous art education. She has studied at the University of Arizona, Glassell School of Art, North Harris County Junior College and London University. Hudson has taken private and group lessons, and has studied with many renowned Houston and nationally known artists through attendance at art workshops and seminars. She’s affiliated with numerous arts organizations including: National Collage Society, Inc; International Society of Experimental Artists (ISEA); Watercolor Art Society-Houston; Art League, Houston, First Frontier Collage Society; Visual Arts Alliance; Society of Layerists in Multi Media (SLMM); and more. Hudson is a member of 10+ Artists salon and has several pieces in the TXT portion of the exhibit. 10+Artists is a Houston based artists group that has been gathering monthly for more than 16 years to share their lives, objectively review their art work and support each other on their individual artistic journeys. TXT explores the written word as communication. Each artist took into consideration different languages and time frames of expressing thought. Along with Rosanne Hudson, other 10+ Artists exhibiting in the TXT show include: Mary Davis, Shirley Ehrle, Kathy Farr, Kathy Gava, Suzan Kraus, Nancy Lickson, Mary Jo McGarvey, Diane McCarten, Linda Penrod, Kim Rootes, Janet Ruffin, Maidie Rutherford, Mary Stone and Mary Wilbanks. For more on 10+ Artists visit http://10plusartists.blogspot.com. Archway Gallery presents Oil and Water, featuring new work from watercolor artist David Connolly and his daughter Kate Connolly in her first major show, exhibiting works in oil. The exhibition will be on display March 5 through March 31, 2011. Both David and Kate are influenced by their travels. Images from Italy, Argentina, Turkey, New Orleans, and Washington, D.C. are present in their work and are often a springboard for their creations. Kate's focus is on people in their natural environment. She is especially intrigued with the interplay of light and color. A statement made by Picasso particularly resonates with Kate: “Though these two people once existed for me, they exist no longer...They are forms and colors that have taken on, meanwhile, the idea of two people and preserved the vibration of their life." In contrast, David's focus is on landscape and birds. He is fascinated by the need of birds to camouflage their presence to survive. He finds watercolor is a wonderful medium for capturing the soul or essence of his subjects. Archway Gallery presents Body, Surface, Signs, featuring new work from potter Albert Goldreich and painter Becky Soria. The exhibition will be on display from January 2 – February 3, 2011. The artists will be on hand to visit with guests firsthand during the exhibition opening reception on Saturday, January 8 from 5 – 8 pm at the gallery, with an artists’ talk at 5:30 pm. Goldreich, an Archway member artist, brings to life in all new pieces a remarkable combination of vivid, textured designs, overlaid with unusual techniques of glaze application. Goldreich approaches each piece as an individual work of art. His passion for the craft takes shape in the Body, Surface and Signs evident in each one-of-a-kind piece exemplifying the creative heart and soul of this extraordinary craftsman. Goldreich’s fascination for clay began back in 1975, while living in South Africa and studying with well-known South African potter, Digby Hoets. Goldreich immigrated to the United States in 1981 and in March 2005 his love for pottery became a fulltime profession. Whether creating by hand or using the potter's wheel his unique designs reflect not only his South African heritage, but encompass contemporary, universal appeal, being both functional and decorative. Guest artist Soria selected a group of works with diverse abstract female and male figures, as well as a few small paintings from her collection of works with a “primitive approach.” Body, Surface, Signs are evident in Soria’s works demonstrating with each painting her intense search for meanings. Her background in biology and the sciences influence the subject matter of her paintings. Her paintings tend to be impressionistic, but abstracted images, at first glance one can perceive surreal allusions and nuances combined with conceptual references; these images often suggest growth, change and mutation. She seeks to depict these ideas, not as objective realities, but rather as subjective responses to her reality tunnels. Soria engages the viewer with a variety of human being’s narratives visually articulated, not so much by abstracted forms of the body, as by primeval elemental forms - a materia originalis - of dense, rich color and complex textures that churn human and animal flesh. Yet that very density, like the illusoriness one reads in a painting, appears as not so real. Like the figures in her images, these forms are constantly being dissolved and reformed, brought to a rebirth and dying every instant. Slowly, Soria explores her own visual language, a language called into being by her own experiences. Soria was born in Bolivia, South America and grew up in an art conducive environment, where from an early age, she was exposed to classical music, visual arts and ballet/choreography. She later pursued her love for the arts in studios of South American artists. Soria continued her studies at the Glassell School of Art in Houston shortly after her move to the US. Houston proved to be a fertile ground for her artistic career, where she has been showing her works in many galleries and different venues in the US as well as Switzerland, Italy, Germany, Canada and South America.